The latest news, reviews, and best deals on the internet. Tired of facing continuous daily reminders prompting you to upgrade to Windows 10? 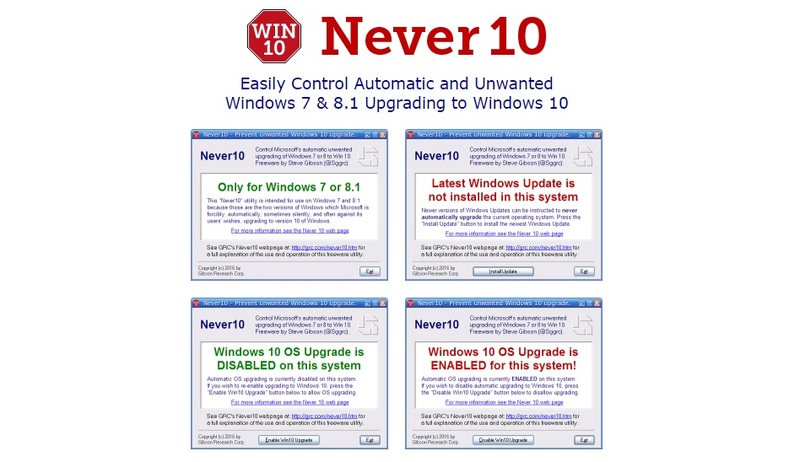 Never 10 is a small tool that can get rid of it in Windows 7 and 8.1 systems. While we strongly recommend the upgrade to Windows 10, this is ultimately something each and every user should decide by themselves. And it's quite annoying that Microsoft didn't provide a simple "do not bother me anymore" option for all those not wanting to do so. In fact, there's a way, but it requires you to mess around in the Registry, which is something most users won't feel comfortable doing, hence this Never 10, which will do it for you. Under this key, the 32-bit DWORD value “DisableGwx” is set to 1 or completely deleted. Under this key, the 32-bit DWORD value “DisableOSUpgrade” is set to 1 or completely deleted. So, if you don't trust a program doing it for you, you can always do it yourself. And, should you ever change your mind, Never 10 can also revert back the settings so you can upgrade to Windows 10. As it's used to say, you should never say never.